The Sayle Twins, Fulham 1984. I first met Alexei Sayle in late 1980 on a college campus in Exeter. The previous month, my ‘Skinheads’ exhibition in London had proved to be very popular and it had transferred to the University there. I went down for the opening night and afterwards got taken to see a stand up comedian playing in the Student Union bar. I’d never heard of Alexei Sayle before and I’d certainly never, ever seen a comedian with such a singular approach. He was a large, slightly chubby man and that night he wore a very tight grey suit, a leather pork pie hat and Dr Marten boots. He effected a pronounced East London accent which, from time to time, lapsed into what I later found out was his native Liverpudlian. His comedy persona was that of a jitterbugging, cockney wide boy. But, significantly, a cockney wide boy with an aggressively left wing world-view. In real life it turned out that Alexei was a committed Communist, as were his parents, and he exaggerated aspects of his somewhat untypical upbringing in his act. His comedy was surreal, physical and undeniably political. Prior to Alexei Sayle, stand up comedians just did not prance around in a tight suits and big boots in the manner that he did (with the possible exception of Max Wall). Before he became a comedian, Alexei had been a drama teacher and, once one learnt this fact, the physicality of his performance became understandable. Before Alexei Sayle, UK comedians might have been satirical, sometimes heavily so, but they were never quite as overtly political. And the strange thing was, unlike most other comedians I’d seen prior to that, he didn’t appear to need to be liked by his own audience. This seemed distinctly odd back then. Eventually comedians like Andrew Dice Clay and Jerry Sadowitz would turn abusing their own audience into an art from. But this was 1980. He didn’t go down well that night. Not at all. Almost all his audience where white, middle class students and much of his material that night was specifically targeted at the desires and aspirations of their class. He derided the kind of people who slept on futons and ate yoghurt and lived in nice houses and gave dinner parties. It was at a time when most of the country had yet to appreciate the full horror of what Margaret Thatcher was trying to do to the social strata. The students mostly sat there in open mouthed silence. And of course, it was also a little before the term ‘alternative comedy’ had been coined and Alexei Sayle hadn’t yet featured on TV. Had Alexei appeared at Exeter even a year after he did, student self awareness invariably being what it is, he would have gone down a storm. But... in 1980 they didn’t know what hit them. Alexei was part of a comedy new wave that, within a couple of years, would make most of the rest of the British TV comics seem complacent, old fashioned, irrelevant, sexist and bitter. With most there was really no “seem” about it. (Think Bernard Manning or Jim Davidson here rather than someone like Peter Cook. Peter Cook was rightly revered by the new wave). That first time I saw Alexei perform, I was certainly taken aback by his combative, in-your-face style. But I thought he was very good. It wasn’t so much laugh out loud comedy as much as extremely amusing and thought provoking. After his performance, I was introduced to him in his dressing room. He couldn’t have been more different from his stage persona. He was intelligent, softly spoken and friendly. And, for some odd reason, we hit it off immediately. During the following couple of years the Comic Strip in Soho, which Alexei MC’ed, became big news. The small group of comedians that performed there almost all became stars. It was the biggest shake up to the UK comedy scene since Monty Python. Or maybe The Goons. I got commissioned to photograph him many times in the early ‘80s. So we gradually became quite good friends. The cover shot used for Alexei's first book ’Train To Hell’ was taken from a shoot I did for The Face magazine. I also photographed him pretending to exercise in a gym, also for The Face, and I shot some portraits for a NME interview in his Fulham flat. Part of his act, at that point, was a surreal cockney rap called ‘Ullo John! Got a New Motor?’ It was as if a character from a Guy Ritchie film had been animated and set to music. (The title itself was taken from the popular TV show ‘Minder’). Although on stage Alexei performed the rap acapella, whilst sort of leaping around the stage, such was his popularity at the time that a record company soon saw the potential of the piece. Some trendy producers were wheeled in to add a backing track and hey presto ‘Ullo John! Got a New Motor?’ was released as a pop single. And NME commissioned me to take some more photos. After thinking about it for a while, my best idea for the shoot was to take Alexei to this big car breakers yard in North London and photograph him in front of a huge backdrop of piled up wrecked and rusting cars. A sort of visual joke. You might say that, as a photographic idea, this visual joke was rather literal and also possibly a bit obvious. You might be right. At that point I was very much still learning my craft, I’d only been a full time professional for about a year, and often my ideas were a shade too literal. It took me ten years, at least, to realise I didn’t need those sorts of ideas, literal or otherwise. Nevertheless, one morning Alexei and I motored over to the car breakers yard and we went into the office to ask for the okay to do a few photos. I remember it very clearly. The guy behind the counter didn’t even look up from what he was doing. He said to me “whatever you want, the answer’s ‘ no’ ”. Obviously if I’d had any sense, I would have rung up or, even better, got someone from NME to ring up and find out if we could do a shoot there beforehand. If I’m honest, I didn’t have much sense then (and I don’t have all that much more now). And I’ve always hated taking “no" for an answer. The car breakers yard was huge. There were thousands of cars there in a wide landscape of brown, rusty metal with hills of them as high as houses. And all presided over by a few greasy, rough looking men and a dog or two - also quite greasy and rough looking. We walked out of the guy’s office and, not to be deflected, I suggested we just drive around the perimeter fence, find a spot where we couldn’t be observed, climb over the fence and do the shoot anyway. I reckoned that if we were quick, no one might be any the wiser. Thinking back, it was not really the best plan and we could easily have been arrested or worse. But, as I said, I didn’t have much sense. Alexei was a little nervous. In real life he doesn’t have any of the bravado he has on stage. Off stage, he's extremely shy. He also seemed worried about the dogs and climbing over the fence in his too tight mohair suit. But I managed to persuade him and we did the photos, albeit rather hurriedly. He need not have worried anyway. For a big man, Alexei is very fit. Besides all the cavorting around on stage he does, he’s a keen cyclist as well. If we’d had to run for it, what with me carrying a big bag of cameras, I reckon the dogs would have got to me first. ‘Ullo John! Got a New Motor?’ got to number 15 in the charts and, for a while, Alexei became quite a big star. Because I got on with him so well and he was such a pleasant and compliant subject, (plus I was still new and eager to practise), we arranged to do some more photos as well. I took some press photos for him in his Fulham flat. He wore a very sharp looking dark grey suit and, with his closely cropped hair, he looked particularly hard and aggressive. Almost the visual personification of a professional East End Villain. At some point during this shoot, I got the idea to parody the famous David Bailey photograph of the Kray Twins but using Alexei in both roles. 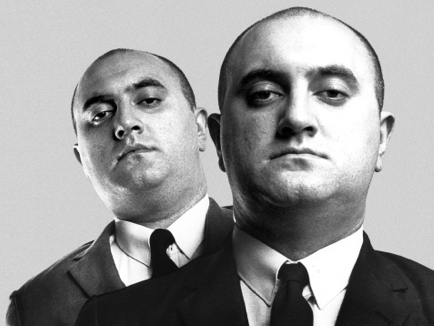 I figured a sort of ersatz Kray Twins image would fit his hard nut stage persona like a glove. And so it proved. Alexei was keen to do it. Unfortunately, at that time, my experience of shooting in a studio with studio strobes was virtually non existent And the few studio shoots I had done up to that point had all been set up for me by friends. So I did what I always did. I persuaded friend to lend me his studio and, whilst he was at it, set all the lights up for me as well. I suppose being a photographer will always be easy if one has a seasoned professional on hand to lend you their studio, their equipment and show you how to do virtually everything bar pressing the button. And I was cheeky in the extreme. I wouldn’t have got started if I hadn’t been. I really don’t know how or why I ever got away with it. I even got the guy who owned the studio to stand in, so that the Alexei twin at the front would cast a shadow on the Alexei twin at the back. Afterwards, since it was before the era of Photoshop, I composited the image in the darkroom using masks cut from black paper. Since Alexei, as far as I know, doesn’t have a twin brother, I always wondered whether the idea for that song, came from doing this photograph with me. I suspect it did. I also wonder whether the idea for his doing a film in 1985 with the same name emanated from that shoot. In the film, Alexei plays the fictional gangster twins Carl and Sterling Moss. I suspect it did also. For the simple reason that the film company produced a poster advertising the film in which they got another photographer to almost exactly replicate my 'Sayle Twins' photograph. Except it was done, if I may say, rather poorly. I was a bit chagrined about this. I wondered why they couldn’t have just used my original and why another photographer had the gall to simply copy what I’d already done. But I guess I ripped off David Bailey and, in turn, someone else ripped me off. Of course, mine was intended to be an affectionate parody. Alexei didn’t mention anything about it. And there’s nothing about either photograph on his website. I haven’t seen him now for many years but I guess I could ask him if my recollection of the circumstances around the photo match his own. If he responds I’ll post it on here.